One of the commonly asked questions from our users is how to add another IP address to their server. You can assign your own private IP address to your control panel by creating a VPN tunnel. Whether you want to build your own Virtual Private Network (VPN), or assign an SSL certificate to that IP address, you have several options. From all of the possible options, the most optimal ones are between PPTP and OpenVPN. A Point-To-Point Tunneling Protocol (PPTP) allows you to implement your own VPN very quickly, and is compatible with most mobile devices. Even though PPTP is less secure than OpenVPN, it is also faster and uses less CPU resources. Where client is the username, server is type of service – pptpd for our example, secret is the password, and IP addresses specifies which IP address may authenticate. By setting ‘*’ in IP addresses field, you specify that you would accept username/password pair for any IP. It is important to enable IP forwarding on your PPTP server. This will allow you to forward packets between public IP and private IPs that you setup with PPTP. If you would like to restrict which servers can connect to your control panel, you can setup an iptables rule that restricts TCP connects to port 1723. 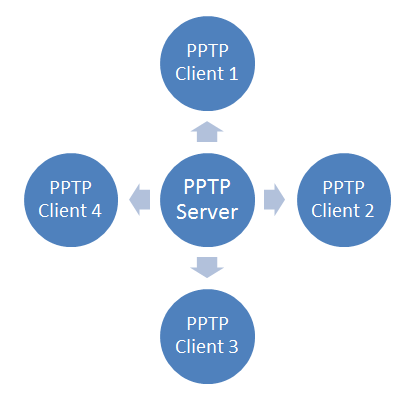 Now we can ‘call’ this PPTP server, since this is a point-to-point protocol.